I was lucky enough to get a Kershaw Tilt this late. The price I paid for this knife is a bit high, but even so, this knife is worth every last penny and more. The carbon fiber scale is great looking and very well machined. The ergonomics are fantastic any way you hold the knife, although the sharp corner of the pocket clip may be slightly uncomfortable. The cutting edge on this knife is made from Vanax 75, supposedly a very rare supersteel. The rest of the blade is 420 stainless. The liner and locking side of the knife is titanium, as is the pocket clip. The frame lock is very strong, and is cut out in an ingenius way so that hyperextension is impossible. Overall, this knife is pretty much uncompromising in both materials and engineering. If you can find one, get one. I got three of the original batch of Kershaw Tilt's and I'll likely never sell them. As far as I'm concerned, it's perfect in every respect. The weight is increadibly light for a knife this larger, it has perfect ergonomics, amazing materials and the fit and finish is on par with knives that cost twice as much, even at just over two bones. I've replaced my old Volt with a Tilt as my new EDC and it's been just an amazing piece of equipment. Because I have three I'm not worried about messing one up, and have actually gotten quite a bit of use on it. The finishes are durable, Vanex-75 holds a stupidly sharp edge and the bearing system is awesome. The only bad thing I can say about it is it's hard to buy one, since Kershaw is having tons of problems producing them. So let's get to business. 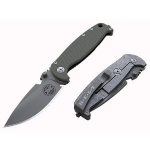 The Kershaw Tilt represents to me a breakthrough moment in design innovation at Kershaw. It is tough, nimble, big, light, beautiful, wicked and functional. When it comes to looks, the Tilt is in it's own class. It's almost ironic that the company that made Ken Onion's curvilinear forms accessible to the greater public would be the same company that would release Ken Onion's aesthetic antithesis. Gone are the straight-from-the-barrier-reef flowing lines and supple three-dimensional molding. Enter instead a stark, bold, angularity that would seem more at home in a museum's modern sculpture collection than swimming in the ocean. The Tilt's unique look makes it extremely hard to think of another production knife (or even limited series knife) at this price point that is worthy of comparison. Double or triple the price and you're left only with particular custom makers. This is rarified air, and I applaud the company for it's ambition in pushing the boundaries and daring to make a knife that looks nothing like any other. 1) Udderholm Vanax 75. Scores a penny. Curls a steel nail. Shaves arm hair afterwards. I haven't sharpened it because it hasn't needed it yet. 2) KVT (Kershaw Velocity Technology) Opening System. So fast it's scary. But make sure your fingers are clear when you're closing her up. It's fast both ways. I look forward to using the Tilt on my future camp/surf trips to see how this pivot system really holds up. Exposure to salt air and random debris is my biggest concern here. Will the ball bearings seize or slow? I have no answer at this time, and the fast way to find out is to bury it in the sand and then throw it into the ocean and fish it back out. I'm too big of a chicken to do that (yet), so I'll just let what happens, well, happen. Ask me in a year. 3) Frame Limiter Technology. This is the one that really gets me. Knifemakers the world over have devised all kinds of toys and tricks to keep users from overextending the lock bar on their frame lock knives. The most common solution is to bolt an additional piece of metal onto the frame to act as a stop. Others hope the presence of the pocket clip will be enough to deter overextension. Kershaw throws out the playbook and rethinks this problem from the ground up. And they came up with a solution that is as simple as it is brilliant. And it's a all just a matter of geometry. You see, every one else cuts the gap that divides the lock bar from the scale like this - scale ___||___ lock bar. It's always been perpendicular. But on the Tilt, the cut line is cut at an angle so that a cross-section view of the gap between the two is shaped like this - scale___//___lockbar. When the lock bar raises up, it's angled surface comes into contact with the angled surface of the scale and the bar stops dead in its tracks. No additional piece, just additional thinking. Dang. I wish I would have thought of that. "A design isn't finished until somebody is using it." Let's get to guts of the matter. How does the knife function? The blade: The blade is remarkably thin for such a large knife, and as such has performed admirably for food prep. I didn't think I'd use this blade for that purpose, but the thin, straight, crazy sharp edge, combined with just enough finger clearance makes this knife a go-to kitchen tool. Who would have thought? My love affair with knives started in the kitchen, and my love affair with Kershaw started with Shun, so this pleases me to no end. For those of you that might be worried that the thin blade might lack of strength, I can only refer you to my note above about the steel. this thing whittles wood, scores copper and tin and even curls a smile into a 16 penny nail. I'm satisfied. The handle: This is where I have a little bit of an issue. The points at the top and bottom of the handle , and particularly the one near the pivot add 1/2 an inch or more of unnecessary length to the handle. It consumes quite a bit of pocket for a knife with a 3.5" cutting edge. Both the original Volt and my 4" Darrel Ralph offer more cutting edge for a lot less handle bulk than the tilt. But the handle does come with a few benefits. First is the finger clearance mentioned above. You'll have a lot less knuckle rash when making scoring and pushing cuts with the tilt. The large handle of the tilt also offers multiple hand positions. My favorite position for hard use is to grip the bottom half of the handle with the bend at the back of the handle fit into the crook of my thumb. This position gives me a great grip, while keeping my hand far away from harm. The double choil or finger grooves give you plenty of grip for choking up and doing detail work. I'm only a couple of weeks in, but so far the lockup has always been incredibly tight, but not so tight as to make the release difficult to manage. "If design isn't profitable, then it's art." - Henrik Fiskar, Designer of the Aston Martin DB9, Aston Martin V8 Vantage and BMW Z8. I wanted to speak a moment about the Tilt and also about my favorite Kershaw to date, the original Volt. These knives both likely cost more to design and make than they likely ever will generate in income. I hope this never discourages the powers that be over at Kershaw from pushing the boundaries and releasing these knives to the public. If anything, these two knives in particular were priced $100 less than they are worth at the outset. I thank you for taking the time and bringing your two finest creations to date to us, money be damned. Well, that pretty much sums it up. I'll leave you with one final quote, and I'd say the most important one when I think of the Tilt. Thank you so much for your time and comments or questions (if you have them). "People think that design is styling. Design is not style. It's not about giving shape to the shell and not giving a damn about the guts. Good design is a renaissance attitude that combines technology, cognitive science, human need, and beauty to produce something that the world didn't know it was missing." "God is in the details" - Ludwig Mies Van Der Rohe, Architect and father of the modern skyscraper. In full disclosure: this knife came to me in part because it did not pass QC at the factory. It is marked as serial number 073, and while it was not marked with the signifying XXXX, it was clear right out of the package that it is a blem. Specifically, the spine side of the titanium scale is clouded as if it were splattered with a solvent of some sort in the factory. Or perhaps a contaminant was not completely cleaned off before the titanium was anodized? Hard to say, but the blem is strictly aesthetic and only noticeable on inspection. Another small issue was that the lanyard tube pin at the end of the handle was not fully seated, causing a very slight flair between the scales. One quick tap with a soft mallet and it fit perfectly, leaving the finish flaw as the primary blem. But this is all trivial and I did not want to bog my review down with this information. Good Review. Noticed a conspicuous absense in the "o"-12 catalog regarding this knife. Hope they get the problem solved. I am new to the Kershaw family as I acquired a scallion 1620H3 as a gift a couple of years ago. That little knife follows me everywhere and has sold me on Kershaw. I'd like to upscale a little and outside of the 777 I really like this knife. Very entertaining review. Hope to see the update after some salty abuse. This was one of the most entertaining reviews I've read. Great review and great sounding knife.